Alan Crockett and Alan Crockett, Jr. This week, Alan Crockett and Alan Crockett, Jr. discuss different approaches relative to community. Alan Crockett is professor emeritus at Ohio State University. Alan Crockett, Jr., is director at Klamath/Siskiyou Art Center, and an instructor at College of the Siskiyous. 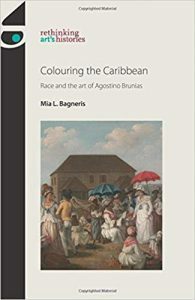 Meredith Gamer reviews Colouring the Caribbean: Race and the Art of Agostino Brunias by Mia L. Bagneris. Read the full review at caa.reviews. 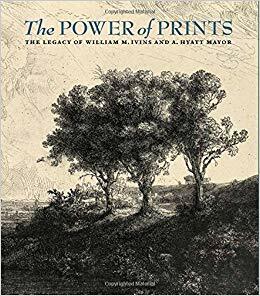 Christine Giviskos reviews The Power of Prints: The Legacy of William M. Ivins and A. Hyatt Mayor by Freyda Spira and Peter Parshall. Read the full review at caa.reviews. This week, Anja Foerschner and Marta Jovanovic discuss feminist art. Dr. Anja Foerschner is a curator, scholar, and professor at the Node Center for Curatorial Studies in Berlin. Marta Jovanovic is an artist and founder of PerformanceHUB in Belgrade. Ginger Elliott Smith reviews Mary Corse: A Survey in Light, edited by Kim Conaty. Read the full review at caa.reviews. 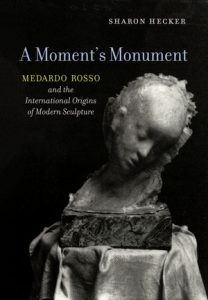 Caroline Levitt writes about A Moment’s Monument: Medardo Rosso and the International Origins of Modern Sculpture by Sharon Hecker. 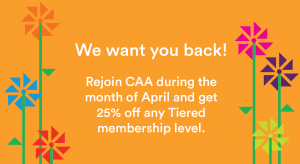 Read the full review at caa.reviews. The following article was written in response to a call for submissions by CAA’s International Committee. It is by Sabrina DeTurk, associate professor, College of Arts and Creative Enterprises, Zayed University, Dubai, United Arab Emirates. Fig. 1: Exterior of Jameel Arts Center, Jaddaf Waterfront, Dubai, UAE. Photo by Sabrina DeTurk. 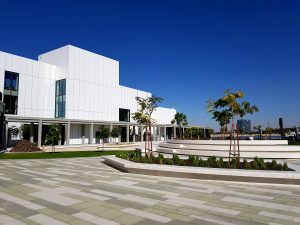 In November 2018, Dubai witnessed the opening of the Jameel Arts Centre, the city’s first non-commercial contemporary arts space (Fig. 1). Located on the banks of the Dubai Creek, in the still-developing area of the Jaddaf Waterfront, the center is a project of the Saudi-based organization Art Jameel, a foundation focused on arts and culture programming that is sponsored by the Jameel family. The Jameel Arts Centre will be programmed as a kunsthalle, featuring temporary exhibitions showcasing works drawn from the Jameel collection as well as commissioned works by contemporary artists and those on loan from other institutions. Community events and educational outreach are also key elements of the center’s programming initiatives and the 107,640 square-foot space includes facilities such as an open-access library of over 3,000 volumes as well as coworking areas. There will also be a sculpture park as well as an outdoor arena for performing arts or film screenings. The Jameel Arts Centre’s inaugural exhibitions included a series of artist’s rooms featuring the work of women artists from the Middle East whose work has garnered critical acclaim though not always international visibility. Maha Al Malluh (Saudi Arabia), Mounira Al Solh (Lebanon), Lala Rukh (Pakistan), and Chiharu Shiota (Japan) showed work that reflected on the personal, communal, and political, sometimes all in one piece. In Maha Al Malluh’s sculpture, Food for Thought, dozens of well-used cooking pots of all sizes are affixed to two walls of the gallery with their undersides facing the viewer. The burns, scrapes and dents on these surfaces become both a pattern and a portrait, suggesting the many meals, large and small, cooked and served in these vessels. The pots invoke both an individual and collective activity of dining. One senses that these pots have traveled far to reach their current destination, perhaps reflecting the experience of refugees who have fled from so many troubled parts of the region, often with few possessions other than simple cooking utensils and basic clothing. Lala Rukh’s minimalist and meditative prints and video speak to the personal experience of her mother’s death as well as the changing political landscape of Southeast Asia in the 1990s. 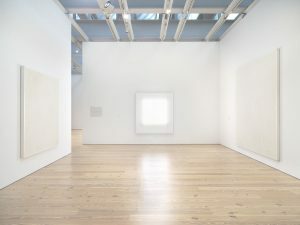 However, the darkness of the room in which the works are displayed made it all but impossible to read the contextualizing and interpretive materials that are necessary to understand the meaning of Rukh’s subtle forms. Fig. 2: Installation view of Chiharu Shiota, Departure (2018). Photo by Sabrina DeTurk. The inclusion of a sculptural installation by Chiharu Shiota, featuring an Arabian dhow (sailing vessel) sourced from a local boatyard, struck an odd note among the rooms (Fig. 2). 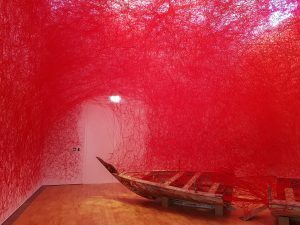 While Shiota’s sculpture, which featured her signature webs of red yarn, was visually compelling, there was little sense, beyond the inclusion of the local boat, of its contribution to the larger dialogues encouraged by the exhibitions. In an image-obsessed city such as Dubai, one can’t help but wonder if this installation served more as an Instagrammable photo opportunity than as a work of serious contemporary art. The inaugural group exhibition at Jameel Arts Centre, Crude, was curated by Murtaza Vali and featured the work of eighteen artists and artist collectives. In the show’s catalogue, Antonia Carver, the Director of Art Jameel, described the exhibition as “presenting an innovative material reading of a substance so crucial in shaping local and regional histories and cultures.” The included works run the gamut from archival photographs to video to sculptural installations to found objects and reflect a diversity of artistic approaches to the cultural, political, and economic significance of oil in the region throughout the last six decades. Fig. 3: Houshang Pezeshknia, Portrait d’homme (1949). Photo by Sabrina DeTurk. 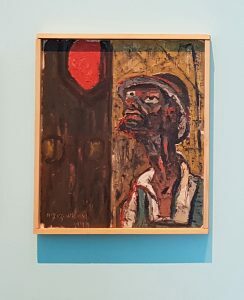 The earliest works in the show, documentary photographs by the Iraqi, Latif Al Ani, and paintings by the Iranian, Houshang Pezeshknia (Portrait d’homme, 1949, Fig. 3), highlight the role that the discovery of oil played in shaping the modern culture and identity of both countries. Al Ani’s photographs focus on the material benefits of the oil industry, featuring images of new, modernist housing developments and smiling children showing the bottles of milk now provided as part of the government school lunch program. Pezeshknia’s paintings are more introspective; their rough brushstrokes emphasize the harsh features of those who work on the pipelines and the scars left on the Iranian landscape by the new technologies of oil extraction. Several artists in the exhibition drew on found images and archival film footage for their works. These include Raja’a Khalid, whose Desert Golf series (2014) uses vintage print media from American publications such as Life magazine to document the seemingly inexorable, if equally inexplicable, compulsion that expatriate oil executives had for finding ways to play golf in the hostile desert landscape. In several of these images, bewildered local residents look on, setting up an us/them dichotomy and pervasive sense of cultural difference that still marks expatriate and local relations in the Gulf region. Fig. 4: Installation view of Crude exhibition. Monira Al Qadiri, Flower Drill (2016) is on the wall. Photo by Sabrina DeTurk. 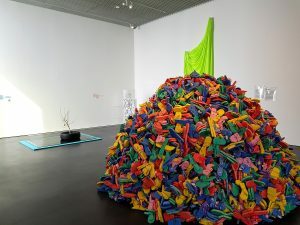 Sculptural installations featured prominently in the exhibition. For example, Monira Al Qadiri’s Flower Drill (2016, Fig. 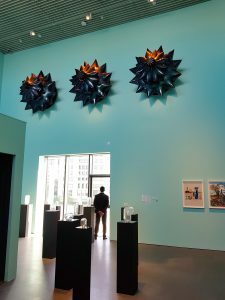 4), displayed high on the wall in one of the galleries, features fiberglass forms based on the design of drill heads and coated in two-toned automotive paint, connecting the work to both the initial and final stages of oil production and consumption. Alessandro Balteo-Yazbek’s Last Oil Barrel is a tiny wooden sculpture of a barrel, whose price is linked to oil futures and whose value will be determined only at some unspecified date in the future when a sale is fixed, reflecting the connections between the commodity value of both art and oil. The artist identifies the date of the work as “postponed,” indicating that it remains in some way incomplete until that time. Although Crude was an intellectually rigorous and aesthetically compelling first exhibition from the Jameel Arts Centre, it remains to be seen whether there will be a sufficient audience for this type of show in Dubai over the long term. 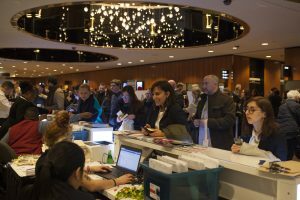 While the center’s opening weekend saw packed galleries, a weekday in January found the author almost alone in the spaces. The question of representation and inclusion of Emirati artists will undoubtedly also be raised at some point in the center’s development. A sculpture by the pioneering Emirati conceptualist artist Hassan Sharif (Fig. 5) was included in Crude and works by Emirati sculptors Shaikha Al-Mazrou and Mohammed Ahmed Ibrahim were shown in the lobby and outside garden respectively. However, this is but a small sample of the variety of contemporary art being produced in the United Arab Emirates and local artists may, understandably, begin to call for greater visibility in this high-profile contemporary arts space. The Jaddaf Waterfront remains under construction and as yet there is not a sustained community to support the idea of the Jameel Arts Centre thriving as a local creative hub. That said, the potential for growth and development is there and the openness with which the center is positioning itself is welcome in a city where the arts scene can often feel closed and difficult to penetrate. Jameel Arts Centre is a welcome addition to the creative landscape of Dubai and will hopefully continue to develop as a space for contemporary expression.